Remember that awful, neon-green, carpet-looking artificial grass? Well, thanks to the hard work of artificial turf manufacturers, it is a thing of the past! Synthetic grass manufacturers have been hard at work for years, trying to come up with the perfect product that you can be proud to show off in front of your own home. 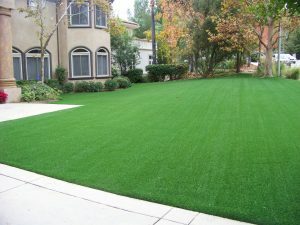 In fact, it’s because of their hard work that residential artificial grass is so popular! So, what exactly have synthetic grass manufacturers done to beef up their product? Infill is tiny particles of rubber or sand that is used to mimic real soil. It cushions every step you take, so that hard, thin artificial turf is a thing of the past. Plus, infill makes each blade of fake grass stand up taller. That way, it looks like real, plush grass. Today’s artificial grass comes in a virtual rainbow of colors. Whether you need authentic green, bold blue, or even fire-engine red, you can get fake grass in any color you want. An artificial grass lawn doesn’t feel like a rug anymore. Instead, it’s been carefully-crafted to feel just like real grass. That way, if you’re playing on it with your kids, taking the dog for a walk, or laying out in the sun, it won’t feel “fake”.